Guys. YOU GUYS. Baby snow leopards. On camera. Live. Right now. QUICKLY YOU GUYS THEY'RE PURRING. 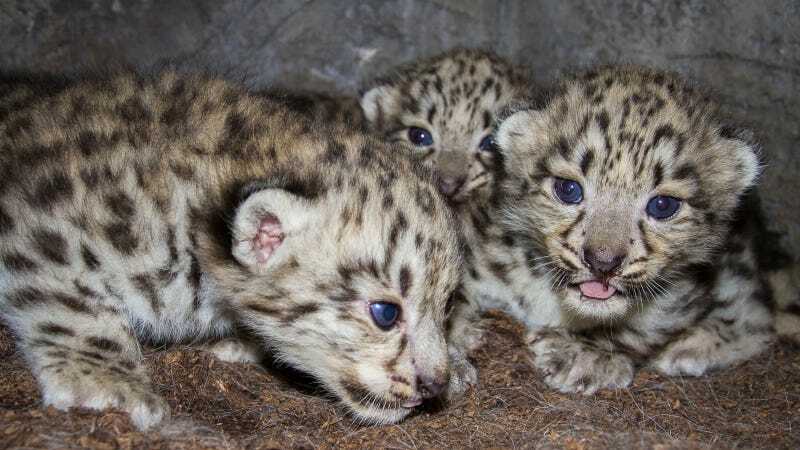 Late last month, three snow leopard cubs were born at the Nordens Ark zoo in Bohuslän, Sweden. A webcam was promptly set up in their den, and has since been broadcasting their earliest days (which are spent mostly sleeping and being generally adorable) for all the world to see. Oh, we're sorry – were you planning on being productive this afternoon? Snow leopards are notoriously elusive in the wild, a fact that can make studying them incredibly difficult. "With the new camera," write the rolks at Nordens Ark, "we can follow the female and cubs in the den. We study their behavior and may thus gain knowledge that is extremely important for those doing research on snow leopards in the wild." Read more about Nordens Ark – a non-profit organization dedicated to the preservation of endangered species like the snow leopard – on their website.